For stable links, please refer to www.ibi.vu.nl/programs/ or www.ibi.vu.nl/programs/cghnormaliterwww/. CGHnormaliter is a new strategy for improved normalization of dual-channel aCGH data displaying imbalanced aberrations. 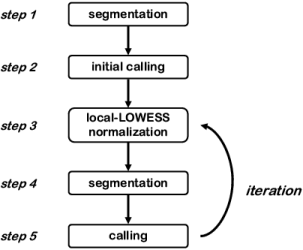 First, provisory balanced copy numbers are identified and subsequently used for normalization based on LOWESS. These two steps are then iterated to refine the normalization. See the figure at the right for a schematic overview. The assumption here is that the temporary exclusion of aberrations allows for a more appropriate calculation of the LOWESS regression curve. As a result, after normalization, the log2 intensity ratios of the normals will generally be closer to zero and better reflect the biological reality. We coin this normalization strategy 'local-LOWESS' since only a fraction of the log2 ratios is considered to determine the LOWESS regression curve. The CGHnormaliter method has now become available as a Bioconductor package. For a quick start, a manual is also available. • Van Houte, B.P.P., Binsl, T.W., Hettling, H., Pirovano, W. and Heringa, J. (2009). CGHnormaliter: an iterative strategy to enhance normalization of array CGH data with imbalanced aberrations. BMC Genomics, 10: 401. • Van Houte, B.P.P., Binsl, T.W., Hettling, H. and Heringa, J. (2010). CGHnormaliter: a Bioconductor package for normalization of array CGH data with many CNAs, Bioinformatics, 26(10): 1366-1367.